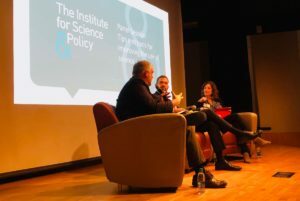 Executive Director Tom Hassenboehler attended The Institute for Science and Policy’s “The Role of Science In Policy Making: A Symposium at the Denver Museum of Nature and Science” which took place in Denver, CO on December 4th. Tom participated in the panel “Tips and Tools for Improving the Use of Science in Policy” with Martin Carcasson, CSU Center for Public Deliberation, and Christine Scanlan, CEO, Keystone Policy Center, to discuss the importance of process, framing, and listening to improve the use of science in policy. More opportunities for digitalization to drive change in energy and environmental policy making!